The Cultural Backgrounds Study Bible will for the first time be available in the NRSV, the translation renowned for its beautiful balance of scholarship and readability. "The NRSV is a rich, beautiful translation that unfortunately has a limited number of study Bibles available to its loyal readers. Our aim is to change that by offering a wide variety of NRSV Bibles now and in the future...."
Zondervan, a division of HarperCollins Christian Publishing, is newly stewarding the publishing giant’s New Revised Standard Version line of Bibles, with several exciting new editions planned. 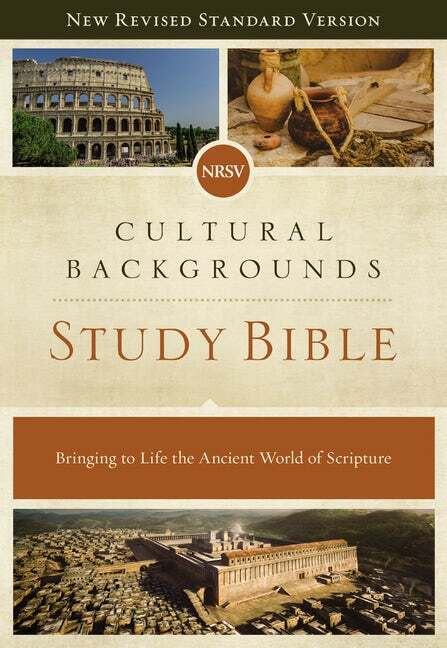 First up is an NRSV edition of the award-winning Cultural Backgrounds Study Bible, which will be out on March 12, 2019. Featuring notes by scholars Dr. John H. Walton and Dr. Craig S. Keener, the study Bible offers readers a “behind-the-scenes” tour of the ancient world, offering deeper insights into even the most familiar passages. Targeted book introductions that explain the context in which each book of the Bible was written. Insightful and informative verse-by-verse study notes that reveal new dimensions of insight to even the most familiar passages. Key Old Testament (Hebrew) and New Testament (Greek) terms that are explained and expanded upon in two helpful reference features. Over 300 in-depth articles on key contextual topics. 375 full-color photos, illustrations, and images from around the world. Dozens of charts, maps, and diagrams in vivid color. Concise Glossary and Concordance, indexes, and other helps. Craig S. Keener (PhD, Duke University) is F. M. and Ada Thompson Professor of Biblical Studies at Asbury Theological Seminary in Wilmore, Kentucky. Especially known for his work on the New Testament in its early Jewish and Greco-Roman settings, Craig is the author of award-winning IVP Bible Background Commentary: New Testament and the New Testament editor for the NIV Cultural Backgrounds Study Bible. John H. Walton (PhD, Hebrew Union College) is professor of Old Testament at Wheaton College Graduate School. He is the author or coauthor of several books, including Chronological and Background Charts of the Old Testament; The IVP Bible Background Commentary: Old Testament; and A Survey of the Old Testament.